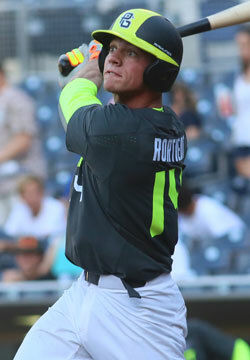 Rortvedt opened a lot of eyes at the Perfect Game National Showcase in mid-June. The primary catcher has solid defense chops behind the plate with good agility, quick feet and a quick release. Where he really stands out, however, is in the batter’s box as Rortvedt has a simple, compact swing from the left side that he repeats extremely well. Rortvedt also flashed some usable in-game power, smashing a home run to the power alley in right-center field at the showcase.